Lotions, Potions & Me: #75 I finally feel much better! #75 I finally feel much better! 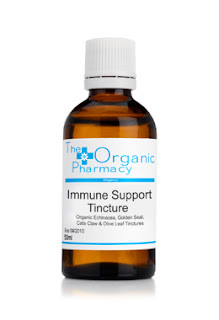 I gorged out on a lot of fruit and vegetables but the one product that I thought really helped is called the Immune Support Tincture from The Organic Pharmacy. Echinacea is popularly believed to be an immunostimulator, stimulating the body's non-specific immune system and warding off infections. Goldenseal has gained a reputation as a herbal antibiotic and immune system enhancer. Its numerous uses are attributed to its antibiotic, anti-inflammatory and astringent properties. It soothes irritated mucus membranes aiding the eyes, ears, nose and throat. Taken at the first signs of respiratory problems, colds or flu, Goldenseal helps can help to prevent further symptoms from developing. It comes in a tincture form and you have to put a few drops into water or juice. I have to be honest and say that it doesn’t exactly taste nice but it helps. If like me you are looking for a natural way to boost your immune system then you should look into this. Like any form of medication, herbal or otherwise, I would recommend that you go into the Organic Pharmacy and get some advice from one of the advisors rather than just buy it partly just to ensure that the ingredients with work for you and not interact negatively with anything else that you are taking. Additionally they have so many different tinctures available and there might be something else that is more suitable for you.